The three projects – Queensland Curtis LNG, Santos GLNG and Australia Pacific LNG - are developing coal seam gas in Queensland’s Surat and Bowen Basins. Hundreds of kilometres of pipelines will link the natural gas production wells on the Queensland mainland with a world-class LNG production plant under construction on Curtis Island, which will initially produce more than twenty seven million tonnes of LNG for export each year. These coal seam gas projects are centred on a clean and efficient energy source with half the carbon dioxide emissions of coal. For the upstream mainland wellheads, HART-enabled Rotork CVA modulating electric actuators have been ordered for process valve control at an eventual total of 2000 widely distributed sites. 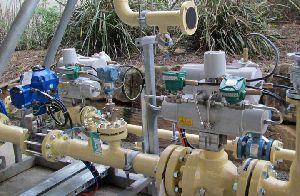 In addition to the natural gas, CVA actuators will also control the flow on the extraction process for coal seam water. This resource will be treated for use by agricultural and industrial customers as well as supplementing domestic water supplies. CVA actuators deliver continuous, repeatable modulating control with a programmable fail to position option. Resolution, repeatability and hysteresis performance is quoted at less than 0.1% of full scale, offering suitability for the most demanding control valve applications. Among other advantages, innovative CVA electric actuation removes the expense of installing and maintaining instrument air supplies at these remote sites, where the pressure of the gas itself is too low to provide a viable source for actuator operation. CVAs are also preferred because electric actuation eliminates the release of any environmentally harmful gas into the atmosphere during valve operations. Nearly 1000 Rotork Skilmatic SI and EH range electro-hydraulic actuators have been ordered for control valves, shutdown valves, wellhead skids and metering skids. These self-contained actuators combine the simplicity and convenience of electrical operation with the modulating precision of hydraulic actuation and the reliability of mechanical failsafe motion. Designed to SIL3 standards for use in safety critical applications, Skilmatic actuators are also programmable for partial stroke testing, enabling valves to be tested without interrupting routine processes. The orders for Rotork electric actuators are completed with IQ actuators for various isolating valve automation duties. All the Rotork electric actuator ranges feature advanced and user-friendly non-intrusive programming and commissioning technologies, combined with integral data logging, diagnostics and asset management capabilities. The balance of Rotork orders on this giant project involves fluid power actuators for the pipeline and the LNG plants on Curtis Island. The majority of these are CP and GP range pneumatic actuators operating butterfly valves on LNG production lines. The actuators are customised with control packages to meet specific operating duties, including SIL2 and SIL3 applications. The remainder are GO range gas-over-oil actuators, most of which are for the large mainline pipeline shutdown valves. GO actuators are designed to use the pressure of the pipeline gas as the motive power source. Integral control functions facilitate a wide range of duties, usually safety related and including line break, low pressure close, high differential inhibit and ESD. Rotork’s international sales network has made an important contribution to this success, with orders received at Rotork offices in Australia, China, Singapore, Italy and the USA. As well as providing a simplified contractual route for the different products, the Rotork global organisation has the ability to co-ordinate manufacture at various production centres and secure on-time deliveries to customers across the world. In Australia, Rotork has moved to larger premises in order to fully support the Queensland projects.